The inspiring fact about emerging artists is their tremendous drive to create. This exhibition at the NM Cancer Center features paintings, works on paper and photography by artists in that fertile state of their careers where art is their life. All of these artists have unique vision, rare talent and are on the rise! 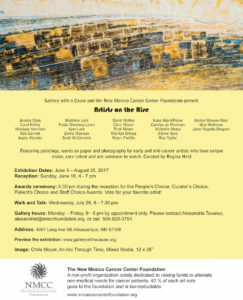 The NM Cancer Center Foundation raises funds to alleviate non-medical needs for cancer patients. 40 % of each art sale goes to the Foundation and is tax-deductable.